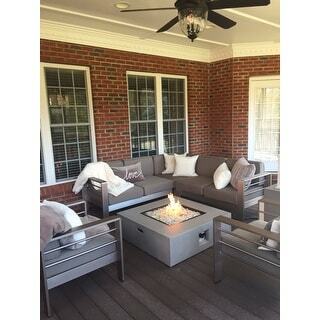 These chairs were purchased to accompany our Cape Coral sectional and Fire Table. They are great- solid, but lightweight and easy to move. No complaints here! The set is a great value, smart and simple looking. Easy assembly. Great Addition to the Sofa Set! 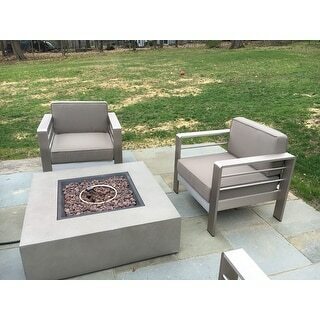 We purchased these chairs to go with the L shaped sofa and fire table set, and are so glad we did! We can seat more people comfortably around the fire table. The chairs are of excellent quality...very heavy and sturdy, and the cushions are thick and seem like they will hold up well being outside on our screened in porch. The cushions are a bit firm at first, but I am sure that they will soften up with time and use. The cushion color is a bit darker than the online pictures, more of a "putty" color. The chairs are plenty wide to cuddle up with a pillow or blanket. Great value for the money spent! We ordered the club chairs to match the v shaped sofa set and loveseat. 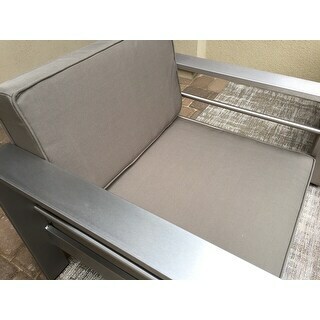 They went together easily and we really like the neutral color of the cushions and the silver aluminum base. 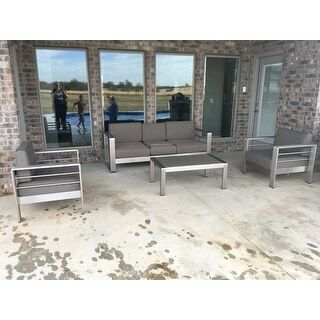 They make a great addition to the rest of the patio furniture we received. 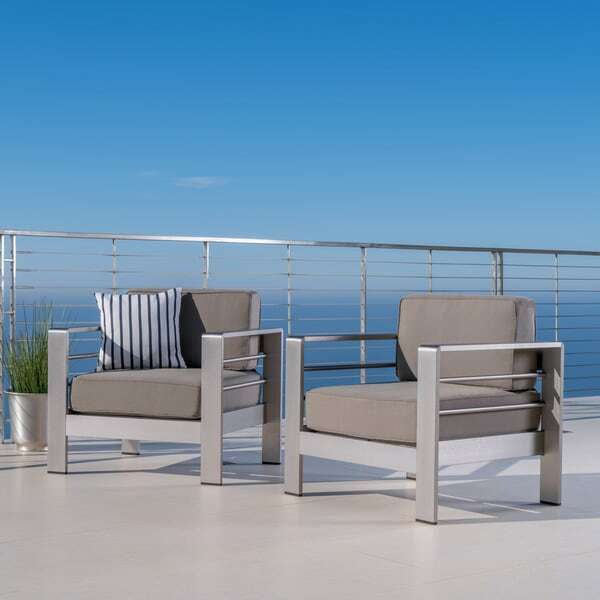 This set of 2 Cape Coral Outdoor Aluminum Club Chairs by Christopher Knight Home are stunning! The modern design with the thick arms and side bar accents are a show stopper! I bought 3 sets of these and will buy more. One chair was missing a piece and they sent it out the next day! Overstocked had the best price on these by far"
Great set. Matches perfectly with the set that I ordered. Well built. I almost returned it because it didn't seem to fit together (one of the chairs), but I put it down and tried again another day and it worked perfectly. I'll update this review if anything comes up. 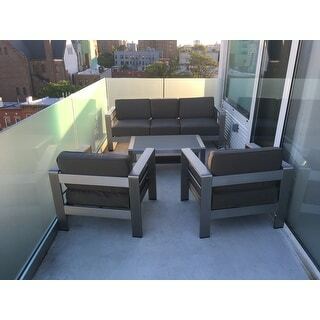 I have been searching for 2 months for the right outdoor furniture for my rooftop terrace and this set did not disappoint. Sleek, modern and beautiful. Looks very high end. Was easy to assemble, is lightweight and the cushions are of top quality. Very thick and should last for many years. Many reviews for other sets lamented on the quality of cushions (often thin) and this set did not disappoint! I received tons of compliments on this. These chairs were extremely simple to put together for me as one person...there’s really not much to assemble. As others have noted, the cushions are better described as grey than as khaki and the Set looks just as it does online. The chairs are roomy and relatively low, which make them perfect for lounging. The seat cushions Velcro to the back cushions to help them stay put. Very satisfied with the look, functionality, and value of this set! I recently recently purchased 4 of these chairs. They are great patio chairs cool and chic, while still very comfortable. However, when they arrived one had a defective part. I contacted customer service and was helped by Laurence L. He was very responsive and resolved my issue asap with replacement parts that arrived quickly. thank you Laurence L. for the awesome customer service!!!! I would highly recommend these chairs as well as the exceptional customer service/support. Very impressed with the quality for price of this product. Chairs were easy to assemble with provided tool. 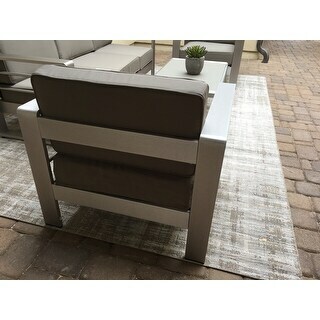 The cloth is thick and durable with non skid feet and a brushed all aluminum frame for a great modern look. The two piece seat and back Velcro together so they don't move around on you. The cloth is more grey then khaki in my opinion. The screw holes were improperly drilled in these chairs, meaning the pieces did not line up and it was impossible to setup. I called Overstock and asked for a refund and for a new chair to be sent. I was clear this was the only remediation that would be acceptable. They refused, only offering to send a replacement with a % discount versus a full refund. As a result, here is my review. I would highly recommend not purchasing these chairs and Overstock has now lost my business. I hope the $ they saved was worth it. 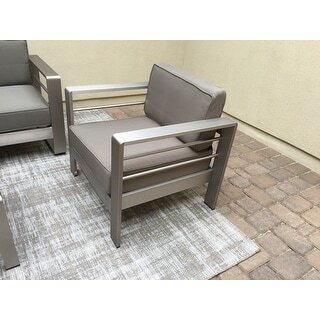 These chairs are perfect to complement our other Christopher Knight patio table pieces. Easy assembly and I love the lighter fabric color — it’s a great neutral not too gray not too beige! Easy to assemble - 15 mins per chair (having learnt how to build the loveseat sofa) Cushions are slightly hard - but not uncomfortable. Very modern looking, very happy with purchase. Very high quality feel; very easy to assemble...very comfortable and with accent pilows for a pop of color, these are exactly what I wanted at an unbelievable price. Great quality especially for the price, cushions are a little stiff but still comfortable. Very easy to assemble. I also bought the sofa and end tables. I love the look of the set but the cushions are very hard. The first time I sat on them I thought I was sitting on cement. They seem, however, to be softening g a bit. These chairs are nice and wide. The arm rests are wide enough to hold a drink if needed. I like that this material wicks away moisture quickly as it is in our pool area. I would definitely recommend. Also exactly as advertised. Also comfortable and well made. These chairs are great! Comfortable cushions (that I store in a large deck box) and they feel very solid. Good for all members of the family to use and enjoy. The seats are at a reasonable height. Great quality for the price. Only con would be that the cushions are very firm, almost hard; however 2 months in, they still look great! the arrival was perfect, no missing parts. the set up was easy, and the comfortability was fantastic. because of the neutral color it will make decorating my enclosed patio easy...nice job . Excellent chairs. Very solid & comfortable. mi juego de patio es moderno y minimalista. Facil de limpiar. feliz con mi compra. We got this to go with the matching L shaped sofa. Looks great on our patio. Modern design and good quality. I recommend having two people work together to put them together. Not too difficult but still easier with two. Our guest like our patio set too. "Does the aluminum get hot in the sun?" "Can I buy just one of this chair?" No, these are only sold in a set of 2. "Can I order just the replacement cushion from this set?" At this time we do not sell replacement cushions separately. "Can you get the chairs with the sunbrella fabric like some of the sets in this same style?" The sunbrella option is only available if the item descriptions details that sunbrella covers are included. if not, the sunbrella is not sold separately. "Has anyone removed the covers for cleaning? And how did you clean them?" "do the cushion cover zip off for washing?"